The distribution phase, i.e. packaging, loading and transport of the charcoal from the kiln to the point of wholesale distribution or large scale industrial use, can represent up to 25% of the total production cost from the forest to the wholesaler. Where charcoal is produced close to a major market, the cost fraction due to distribution will be much lower. However, there are no longer many localities today where the wood resource is close to the final charcoal user and this step in the production chain is, therefore, significant and becoming more so as forest resources are used up. Moreover, transport requires scarce and costly liquid fuels. The cost of transporting charcoal in terms of heat energy units is much lower than transporting fuelwood, because the calorific value of the charcoal is about twice that of dry fuelwood. Hence, charcoal can tolerate a relatively high transport cost and implies that charcoal should be produced wherever possible close to the wood supply and then transported to the market. These transport logistics are of primary importance in planning charcoal production systems. - Unloading and storage operations at major market point. - Low bulk density requiring high volumes to be transported and handled. - Tendency of fresh charcoal to spontaneous heating and ignition through adsorption of oxygen from the air. Experience shows that transport problems are less when there is only a single loading and unloading stage. This is achieved easily when trucks are used. Costs per ton/km are usually lowest when large unit loads are transported. Twenty ton loads using a truck and trailer both equipped with high sides are practical. In this case the charcoal is handled in bulk. Most fines are produced in loading/unloading operations. To reduce this problem transport of charcoal in a single operation from charcoal kiln to main distribution/storage point is recommended. Bulk handling and transport is often not regarded by traditional producers as practical, so that bagging of charcoal is necessary. But where large quantities of charcoal are regularly transported between a production centre and the distribution point, bulk transport without bags should be developed in order to keep down packaging, transport and handling costs. Charcoal easily absorbs water and, therefore, tarpaulins or other covers must be used during transport, to prevent wetting. There is always a risk that charcoal will be wet by rain during the few days it is "curing" at the side of the kiln. Cured charcoal should be transported as soon as practical to reduce this risk. Plastic sheet covers or a galvanized iron open sided storage shed can be used where large amounts must be accumulated prior to transport. Every effort should be made to avoid double handling at the kiln, leading to wasteful production of fines and unnecessary labour costs. Intermediate storage is necessary when large amounts of charcoal must await transportation because of irregular availability of transport, such as road or rail trucks or poor road conditions in remote areas. The following requirements should be observed when laying out an intermediate storage station. It must be sufficiently large to accept the quantity of charcoal to be stored under abnormal conditions, e.g. during a prolonged rainy season, or a period of scarcity of railway transportation. The storage house should be divided into sections, of approximately 2 000 m³ each, separated by walls. It must be covered and must have sufficient facilities for easy and fast handling of the charcoal on its arrival and departure. Unloading into the storing house can be done from the outside through wooden or metallic chutes and loading of railway cars and trucks through manually operated wooden or metallic trapdoors. Trucks should not be allowed inside the storehouse because of fire hazards from internal combustion engines and smoking by truck drivers. Conveyor belts may also be used but mechanization should be minimized because it is expensive. The height of the heaped charcoal should be less than six metres to avoid spontaneous ignition. Incoming charcoal should be dropped as little as possible (two metres maximum) to reduce formation of fines. The charcoal should be unloaded onto a naturally formed slope of charcoal and handling should be reduced to a minimum as each movement produces some fines. The building must be well ventilated and open on all sides to give rapid and easy access in case of fire. It should have no intermediate columns across the roof span. The building structure may be of brick, concrete or steel. The roof should preferably be galvanized sheet but asbestos may be used. The floor may be brick, stone, concrete or even rammed earth. Water pipes with hose connections should be available at different points but, in case of fire, the best method of saving the charcoal is to push the unburnt charcoal out of the building with tractors equipped with shovel blades. The transport of huge tonnages of charcoal from the points of carbonization to the side of the blast furnace has been highly developed in Brazil. The following description of methods followed may be useful for situations requiring transport of large quantities. Approximately 70% of all charcoal produced in the State of Minas Gerais, Brazil, is transported by truck. This is a flexible and fast means of transportation, but expensive. Charcoal can be moved from the kilns to the iron and steel plants immediately after curing. With trucks little charcoal fines are produced as the number of handlings are few. 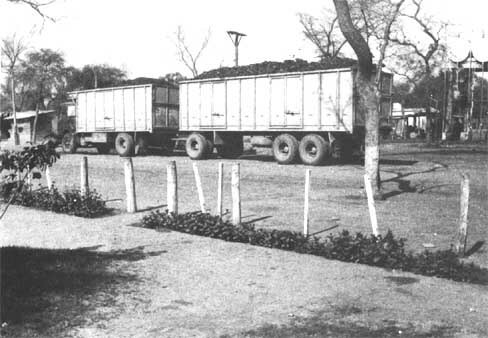 Most of the small pig iron producing plants have no railway connection and must rely solely on truck transportation. Trucks are able to reach isolated kilns, located close to poor roads. A typical truck has the following characteristics: diesel engine powered 145 HP two axles for normal road driving and a third one for fast and safe highway driving to comply with State regulations of maximum axle loading. Carrying capacity 48 m³. Some transport companies use 60 m³ trailers but these are not able to operate on poor roads and have a tendency to overturn. Transportation distances vary from a few to 1 000 km. Many truckers prefer to carry the charcoal in burlap bags (about 25 kg bag or 11 bags/m³ of charcoal). This practice allows general purpose trucks to be used which, on the return journey, can carry other merchandise. Bagged charcoal is bulkier than loose charcoal which "settles" during transport with a volume loss of 2-5%. Trucks loaded with burlap bags also have a greater tendency to overturn than when loaded with lump charcoal. The unloading of burlap bags must be done manually which is a disadvantage. Trucks carrying lump or loose charcoal must have their side height increased to about four metres with mesh type side sheeting to give a reasonable volume corresponding to the truck's weight capacity. All medium and large iron and steel plants in Brazil have rail connections and use rail transport to the maximum because it is much cheaper. Some large companies transport about 40% of their charcoal by rail. One also uses a cable car system. Most railway cars have a capacity of 54 m³, a few 80 m³ and recently some 100 m³ cars have been ordered. There are still some older cars in use with 20 to 30 m³ capacity; these have flat bottoms and wide discharging doors but must be unloaded manually. However, they may also be used for other merchandise as return freight. The newer and larger cars have sloped bottoms and self-discharging doors on both sides of the track, which permit a rapid discharge directly into coal bins or into the storage house. The rail cars are sometimes loaded at the railway siding directly from trucks but mostly from a reloading and storage depot, through hand operated gates or by conveyors. One company has started transporting charcoal by rail over distances of 700 km in big, plastic, bagshaped containers of 3 m³ volume. The savings in transportation costs compared with truck transport are worthwhile. The plastic containers also protect the charcoal against moisture. They are loaded by a mobile crane. The experiment may be extended to fill the containers at the charcoal kilns thus avoiding handling lump charcoal between the kilns and the railway sidings. Rail freight for charcoal is calculated on the basis of 300 kg/m³ of charcoal. All handling at the loading and unloading stations is done by the iron and steel companies which also supply all the necessary equipment and bear all expenses. The cars, however, belong to the railway company, which is government owned. 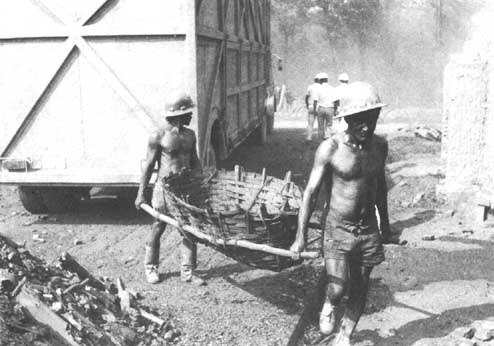 Since 1957 Belgo-Mineira has used an aerial cableway to move a certain proportion of the charcoal produced in one of the principal charcoal manufacturing centres in the Rio Doce region, which is east of their Monlevade iron and steel plant. The length of the cableway is 50 km; the charcoal at 40 t/hr is carried in steel boxes of 1.4 m³ which are suspended from the ropeway and move at 10 km/hr. Another cableway transports all charcoal from the works central storage place to the blast furnace bins, a distance of 1.2 km at 60 t/hr, in boxes of 1.5 m³, moving at 10 km/hr. Cableway transport can be economic and efficient but it must be operated at near full capacity, as the investment is high and its operation must be continuous to be economical. It is therefore necessary that the supply of charcoal at the loading station is continuous and the delivered charcoal volume close to the capacity of the cableway. These conditions are seldom encountered in charcoal manufacturing. For short distances, up to 20 km, and for small quantities, transportation by mules or horses should not be overlooked. It has been used for many years in the State of Minas Gerais. Each mule carries two baskets of 60 kg each. Transportation speed is six km/hr. Loading and unloading are manual. Mules are now only used for intermediate transport of the charcoal to the trucks, when the kilns are located in remote places with difficult access. The iron and steel plant at Manaus, Siderama, located on the Amazon river uses barges for all its iron ore and charcoal transportation. Water transport is very cheap and should be considered when conditions are suitable. Charcoal usually reaches the ultimate domestic user by a complex route which is not the main concern of this manual. But a few remarks are relevant to distribution problems in general. Charcoal is a product which is difficult to adulterate, does not deteriorate in storage and whose only fault is its friability - the fact that it breaks and powders during handling and transport. There is a variation in its quality due to variation in its fixed carbon content. A soft burned charcoal has a high volatile matter and a low fixed carbon content, is corrosive to metals, paper and fibre and packaging material (but not bags of film or woven plastic) and it also tends to smoke during burning. It is fairly resistant to shattering and thus transports and handles without producing very many fines. Hard burned charcoal, on the other hand, is high in fixed carbon content, low in volatiles and is much more friable (an exception is charcoal carbonised at very high temperatures around 1000°C, which is almost pure carbon and can be quite strong. This type of charcoal is rarely seen on the market and is not normally produced for commercial purposes). Hard burned charcoal burns cleanly but may be difficult to ignite. The ideal compromise product when dry has a fixed carbon content of about 75%; a volatile content of about 20%; an ash of about 5% and a bulk density of around 250-300 kg/m³. It is moderately friable. Water is the main adulterant found in charcoal. Good quality charcoal will normally have a moisture content of 5-10%. More than 10% is excessive and indicates rain wetting or adulteration to increase weight. Purchasing charcoal by volume has much to recommend it. It renders invalid the addition of water and other materials as adulterants and discourages mixing in fines to increase weight or handling the charcoal carelessly, thus producing fines, since this would, at the same time, reduce the bulk volume. Therefore, agreement to buy charcoal on a volume basis is fair to both buyer and seller, providing there is a previously agreed method of measurement. Charcoal, once it has been cured for two days, can be stored under cover indefinitely. This allows holding stocks to balance seasonal demand. A wholesale distributor's stock of about two months, annual sales held at the point of wholesale distribution would be good practice. Stocks should be built up before the start of the rainy season and allowed to run down towards the end. In this way retail prices can be stabilised providing the stocks are adequate to service most of the retail market system. Sometimes charcoal production workers who are idle during the rainy season can be employed on retail packaging during this period. Type of packaging depends on the type of retail market and the number of links between wholesaler and final user. The fewer the links, the greater the economy of distribution. Today, in most developing countries, demand is usually strong and, hence, the steps in the distribution system can be simplified, though normally at the inconvenience of the final user. However, in those areas where it is desired to increase sales of charcoal, one must remember that the number of retail points of sale are crucial and that a distribution system must be developed which recognises this. The price structure of retail charcoal sales must reflect adequately the cost of gaining the increased distribution of the product. Otherwise no worthwhile result will be achieved.